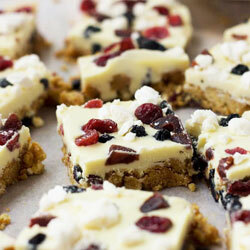 Eton Mess fridge cake – all the flavours of a classic British dessert in a white chocolate fridge cake! 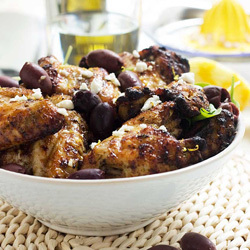 Greek baked chicken wings from Recipe Tin Eats’ new wings cook book! Sooo delicious! 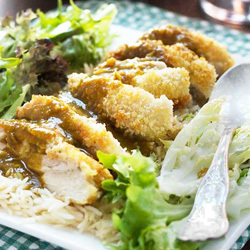 Chicken katsu curry – crispy chicken covered in a mild and tasty curry sauce. Ever tried halloumi cheese? If not, go on, try it! 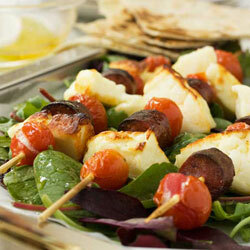 Halloumi, chorizo & tomato skewers with honey lime dressing. 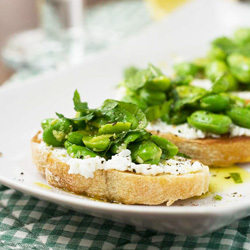 Fava bean, mint & ricotta crostini. 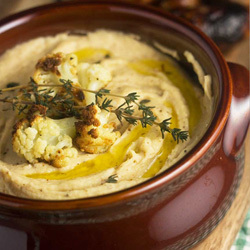 Great for a quick & healthy snack, or even as a snazzy appetizer to serve to guests! 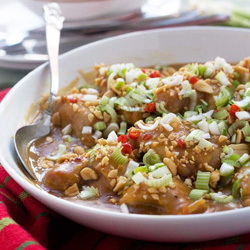 An easy-to-make (and customize!) 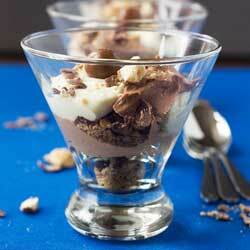 chocolate malt cheesecake in a glass. 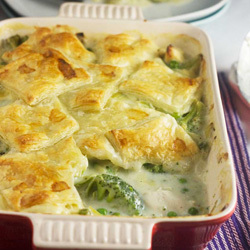 One of my favourite make-ahead desserts! 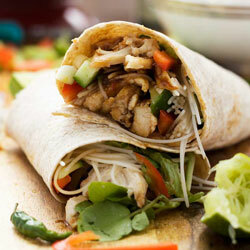 Quick hoi sin chicken noodle wrap – never be stuck over how to use your leftover rotisserie chicken again! 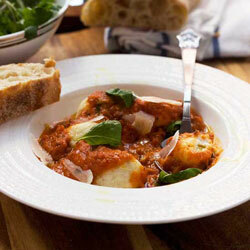 Easy ricotta gnudi with roasted tomato sauce. Gnudi are a bit like gnocchi but much lighter & easier to make! 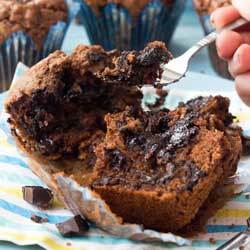 Oozy, gooey triple chocolate muffins with a soft ganache center. 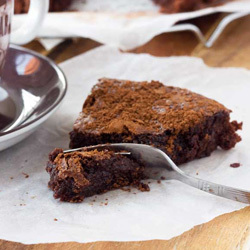 Pure decadence – and so easy to make! 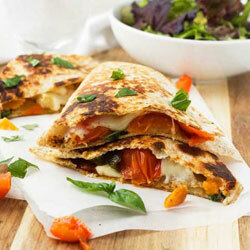 Caprese quesadillas with roasted vegetables – something delicious to use up your leftover roasted vegetables in! 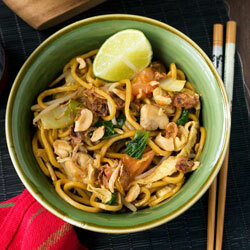 Mee goreng (spicy Indonesian noodles) – make Asian street food easily at home! 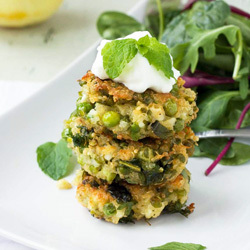 Crispy pea, mint & feta quinoa fritters – a light and healthy little taste of spring! 6-ingredient gooey Swedish chocolate cake (kladdkaka). The BEST chocolate cake! 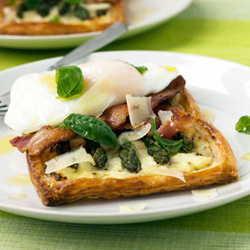 Asparagus brunch tart with parmesan & basil – eat it as is or top with bacon & a poached egg for the perfect spring brunch! 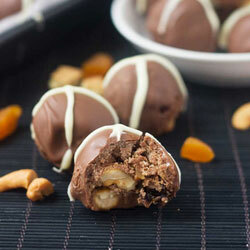 Hot cross bun truffles for Easter! 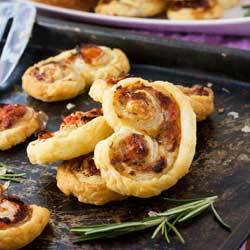 An easier treat to make than hot cross buns! 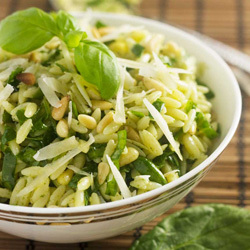 A simple spinach, pesto & parmesan orzo salad – a really nice salad-y side dish for spring! 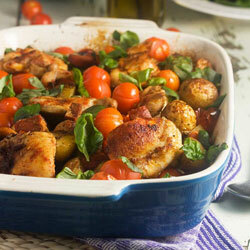 Chicken, chorizo & ‘patatas bravas’ tray bake – you’ll love this one-pot mid-week meal! 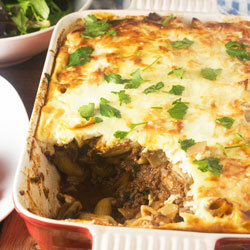 This cheat’s pastitsio has all the flavour of a traditional Greek beef mince pasta bake but without the stodginess! 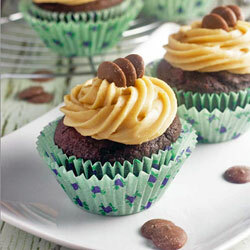 These chocolate stout cupcakes with peanut butter frosting are the perfect way to celebrate Saint Patrick’s Day! 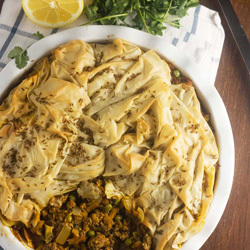 This samosa pie is a cross between a traditional Shepherd’s pie … & a samosa! Are these the best mashed potatoes ever? They combine roasted cauliflower with potato and cheese. Delicious! 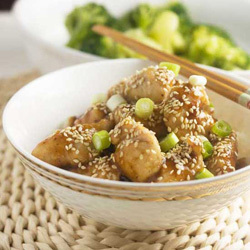 Chicken smothered in a sticky Asian sauce and sesame seeds – ready in just 15 minutes! 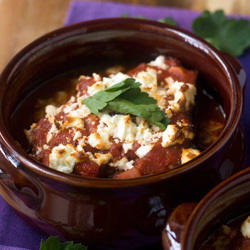 Our favourite baked eggplant with tomato & feta cheese – the most delicious dish I ate in Greece, & so easy to recreate! 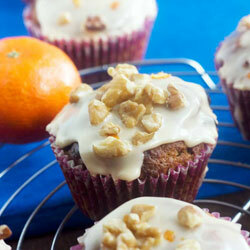 Lightly spiced tangerine, walnut & choc chip muffins – a lovely little sweet snack. 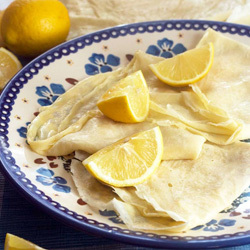 On Shrove Tuesday, my pancakes just have to be simple sugar & lemon crêpes! 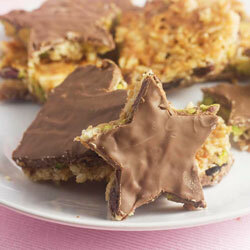 Nutty, coconut-y pistachio heart and star shapes covered in chocolate. What a lovely Valentine’s treat! 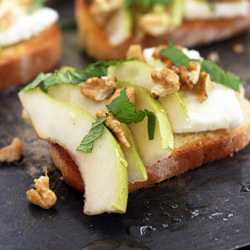 A traditional Italian crostini topped with ripe pear slices, feta cheese, walnuts, honey & fresh mint. 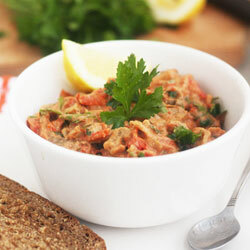 A sweet & smoky dip made with roasted red peppers & eggplant. 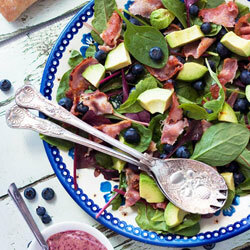 This really lets those Mediterranean ingredients shine! 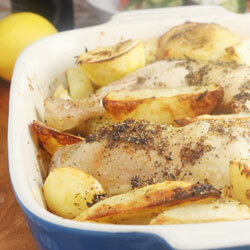 Greek lemon & oregano chicken with crispy potatoes. Serve with a traditional Greek salad for an easy and light one-pot mid-week meal. 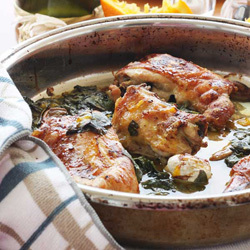 Six light & easy post-holiday dinners including this delicious maple, orange & spinach chicken.